It’s never easy to reinvent an icon – especially when it comes to the Jeep Wrangler. Fortunately for consumers, the all-new Jeep Wrangler JL Unlimited has yet to disappoint since making its debut in late November of 2017. While enhancing the daily handling of the vehicle, the 2018 Jeep Wrangler JL Unlimited stays true to the brands iconic styling and off-road capabilities. For the 2018 model year, the Jeep Wrangler JL Unlimited is offered in four trim levels – Sport, Sport S, Rubicon, and the all-new Sahara. The standard engine for the 2018 lineup is a 3.6-liter V6 engine optimized with Variable Valve Timing (VVT) to improve performance and Engine Stop-Start (ESS) technology to improve conserve fuel when idle. The 3.6-liter engine can generate 285 horsepower and 260 lb-ft of torque, with the option to upgrade to an eight-speed automatic transmission. 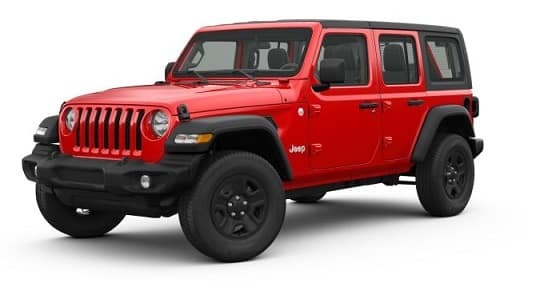 As a result of the 3.6L engine ESS feature, the Jeep Wrangler JL Unlimited has an EPA fuel economy of 17 mpg in the city and 23 mpg on the highway. For those consumers who choose the eight-speed automatic transmission, the fuel economy in the city will increase by 1 mpg. For those interested in a more power, a 2.0-liter turbocharged inline-4 cylinder engine is an available option. Manufactured with gasoline direct injection, this 2.0L engines combustion cycle is more efficient and faster, which equals to better performance. Outputting 270 horsepower and 295 lb-ft of torque while partnering with an eight-speed transmission, Jeep has also installed an eTorque system into this powertrain. This e(for “electric”)Torque system performs hybrid functions like, auto stop/start, electric fuel shut-off, transmission shift management, intelligent battery charging, and regenerative braking. Expect to see this option by late 2018, early 2019. Lastly, a third engine option will be available in 2019 – a 3.0-liter EcoDiesel engine. This EcoDiesel engine is said to produce 260 horsepower and 442 lb-ft of torque, which is the most amount of torque offered in the entire lineup. Similar to the standard 3.6L engine, the EcoDiesel engine is also equipped with the Engine Stop-Start feature, while paired to an eight-speed automatic transmission. According to Jeep, every 2018 Jeep Wrangler JL proudly sports the Trail Rated badge. To earn the badge, a vehicle must conquer a series of grueling tests over the toughest terrain. These tests prove a vehicle’s ability to withstand harsh conditions and deliver incredible off-road capabilities. You can read about them below. The Selec-Trac 4×4 System has the ability to automatically switch from two-wheel drive (2WD) to four-wheel drive (4WD) depending on the weather conditions. Due to the internal wheel speed and traction control sensors, drivers can take on uneven terrains and unpredictable weather conditions for a safer and smoother driving experience, even when four-wheel drive isn’t necessary. Required only when four-wheel power is in use, the Command-Trac 4×4 System is equipped with a NV241 GII transfer case that allows drivers to get through those harder terrains with ease. According to Jeep, the Command-Trac is a proven shift-on-the-fly system with a 2.72:1 low range for rock crawling and neutral for available flat towing (only when properly equipped with the Mopar Flat Tow Wiring Kit). Considered to be Jeep’s “Strongest Grip”, the Rock-Trac 4×4 System is equipped on the Rubicon and offers drivers an exceptional off-road experience due to more control and torque. The Rock-Trac comes with a NV241 Off-Road transfer case with a 4:1 low gear ratio. Additionally, Tru-Lok electronic locking front and rear differentials are also included, paired with an electronic front sway bar disconnect, the standard on the Rubicon. The interior cabin of the 2018 Jeep Wrangler JL Unlimited combines the brand’s authentic style with comfort and high-quality materials. The waterproof interior allows for a more convenient and quicker cleanup process, especially after off-roading through the mud. Updated for the 2018 model year, the Jeep Unlimited dashboard is now equipped with a new center stack, climate and volume control knobs, charging and connectivity ports for media, and ESS that can all be found within the front-seat passengers reach. All four of the Jeep Wrangler JL Unlimited trims share a good amount of the interior seating features like low-back bucket seats, manual four-way front passenger seats and manual six-way driver seat, rear 60/40 folding seats, reclining front seats, and a maximum seating capacity of five passengers. Cloth seats with adjustable head restraints are standard on the Sport and Sport S trims, while the Sahara is the only trim to offer standard cloth low-back bucket seats with the Sahara Logo plus the available option of leather upholstery. Lastly, the Rubicon trim is pick one with Premium cloth-trimmed low-back bucket seats and also offers the option of leather-trimmed seats. Similar to the seating features, the Jeep Wrangler JL Unlimited trim levels also share most convenience features like a 12-volt power outlet, cargo tie down loops, full length floor console, illuminated cup holders, steering wheel mounted audio controls, storage tray, a urethane-wrapped shift knob, and a vehicle information center. The Sport S is the only trim to have the available option of a heated steering wheel, while the Sahara and Rubicon trims offer a leather-wrapped park brake handle and shift knob as an available option. In comparison to its interior design, the exterior of 2018 Jeep Wrangler Unlimited JL exterior advances in modern technology while maintaining the Jeep Wranglers classic design and heritage. The keystone-shaped grille dominates the JLs exterior design, which has been swept back for improved aerodynamics. Also, the JL Unlimited overall weight has been reduced by 200 pounds, as a result of the doors, hood, and windshield frame assembled out of lightweight, heavy-duty aluminium and steel. Each of the JL Unlimited trims are offered with a specific wheel size, which obviously depends on the trim level desired. For instance, the Wrangler Unlimited Sport trim comes standard only with 17-inch x 7.5-inch black steel styled wheels. The Sport S trim comes standard with 17-inch x 7.5-inch tech silver aluminum wheels, the Sahara comes standard with 18-inch x 7.5-inch tech gray polished face wheels, and finally, the Rubicon comes standard with 17-inch x 7.5-inch polished wheels with black pockets. All-season tires are standard on the Sport and Sport S with the available option of 245/75R17 All-terrain tires. The Sahara is standard with All-season tires with the option of All-terrain tires, while the Rubicon is standard with Back Sidewall (BSW) off-road tires. Black door handles and black exterior mirrors are the only two exterior convenience features shared by all trim levels. Standard features only on the base Sport trim include manual fold away mirrors, while molded black front and rear bumpers are standard on the Sport and Sport S trims. Injection molded black front and rear bumpers are standard features only on the Sahara Rubicon, while body colored fender flares are only offered standard on the Sahara, and rock rails are only standard on the Rubicon. Additional exterior features include headlamp off-time delay, incandescent tail lamps, and fog lamps are standard across all trims. However, automatic headlamps are only offered standard on the Sport S, Sahara, and Rubicon trims. Furthermore, halogen headlamps come standard on the Sport, Sahara and Rubicon trims. One of the biggest updates for the 2018 Jeep Wrangler JL Unlimited are the modernized technology and infotainment features. Some of those modernized features include eight speakers throughout the interior cabin, audio jack input for mobile devices, integrated voice command with Bluetooth, and a media hub for USB and Aux. Standard equipment on the Sport and Sport S includes, Uconnect 3 with a 5.0-inch touchscreen display and a cluster 3.5-inch display. The Sahara and Rubicon come standard with Uconnect 4 with a 7.0-inch touchscreen display that includes Apple CarPlay/Google Android Auto capabilities, integrated center stack radio, and a complimentary one-year subscription to SiriusXM Satellite Radio (optional on the Sport and Sport S). Optional features only offered on the Sport S, Sahara, and Rubicon trims include an Alpine Premium Audio System, yet the Sahara and Rubicon touchscreen display can be upgraded to the Uconnect 4C NAV with 8.4-inch display plus HD radio. The 2018 Jeep Wrangler JL Unlimited has over 75 available advanced safety features. Some of those features include, electronic roll mitigation, electronic stability control, hill start assist, traction control and supplemental front seat side airbags. Additionally, a Hydraulic Assist Brake Booster is added in order to supplement the vacuum booster and provide a consistent braking force and performance by using hydraulic pressure generated by the electronic stability control pump. Rear head restraints for outboard seating, ParkView rear backup camera, and sentry key theft deterrent system are some added standard safety features. Keyless Enter ‘n Go, Remote and Remote Proximity Keyless Entry plus Remote Start System are available options on select trims. The 2018 Jeep Wrangler JL Unlimited has a starting MSRP (plus destination fee) of $30,495. All Jeep vehicles are covered by a basic 3-year/36,000 mile warranty, a 5-year/60,000 mile powertrain warranty, roadside assistance for 5 years or 100,000 miles, and rust-through coverage for 5 years or 100,000 miles.